Complete Steel Frames is one of QLD’s leading suppliesr of steel frames for residential housing. In 2012 they started with a basic 5 page brochure website. In 2015 they needed to take things to the next level. So they contacted Partner Digital to redesign and rebuild their website into a fully mobile responsive site, with engaging content such as videos and downloads, and interactive features such as a quote calculator. Their website was completely overhauled and went from 5 pages to about 50 pages. 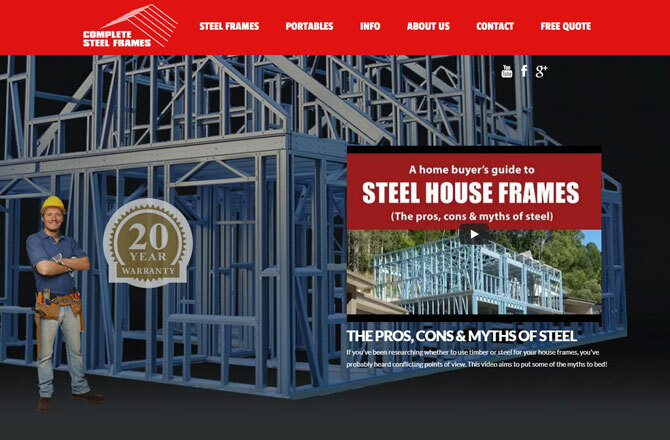 As part of the process Partner Digital carried out SEO on the website, driving it from page 5 to the top of page 1 for terms such as “steel frames brisbane” and “steel house frames brisbane”.